The focal point of 2 Chronicles 36 is not in the stories of the wicked sons of Josiah, Jehoahaz and Jehoiakim, nor in the stories of the brothers Jehoiachin and Zedekiah, who presided over the destruction of Jerusalem and the exile of Judah. These wicked kings do what all the wicked kings who went before them have done—they forsake the law of Moses and David’s organization of the Levites in order to pollute the worship of Yahweh with idolatry and other perversities. And more, the focal point of 2 Chronicles 36 is not in the brief account of how the Chaldeans (i.e., the Babylonians) come against Jerusalem with sword and fire, mistreating the people of Judah and destroying the temple. Repeatedly, Yahweh sends messengers and prophets to warn his people, “But they kept mocking the messengers of God, despising his words and scoffing at his prophets, until the wrath of the LORD rose against his people, until there was no remedy” (2 Chron. 36:16). 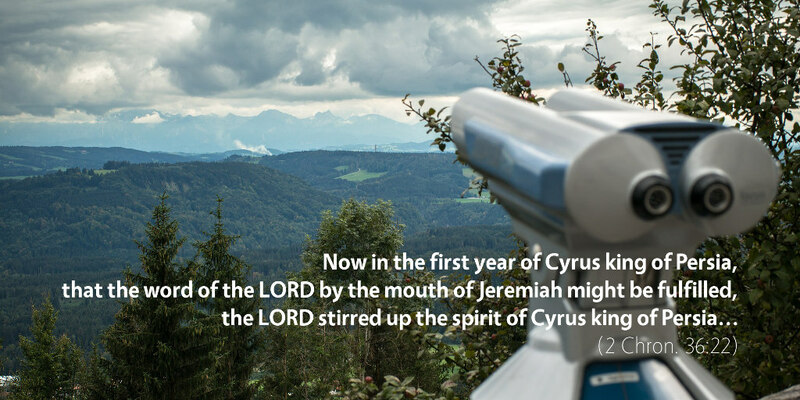 Instead, the focal point of 2 Chronicles 36 comes in the proclamation of Cyrus king of Persia in verses 22–23. There, we find Yahweh stirring up the Persian king’s spirit in order to send the people of Judah back into Jerusalem. It is important to understand that 2 Chronicles was the final book of the Bible in the arrangement of books in the Hebrew Scriptures for the Jews who lived in the days leading up to, and including, the time of Jesus. In other words, this passage here was the final word of the Scriptures for God’s people during the intertestamental period, where they waited through four hundred years of silence to hear from God before Jesus came—a silence that the prophet Amos called a famine of hearing the words of Yahweh (Amos 8:11–12). And as they meditated on this final word of the book, they were left pondering all of God’s promises through the Scriptures thus far. Would God still be faithful to crush the head of the serpent (Gen. 3:15)? Would he still bless all the nations through the offspring of Abraham (Gen. 12:3)? Would a king in David’s line still reign forever on the throne of David (2 Sam. 7:12–13)? This final word of the Old Testament Scriptures, then, doesn’t come as an ending but as a “To Be Continued…” More of the story is coming—and through this next installment, Yahweh would tie up all of these loose threads (and more) into the perfect package in the person of his only Son, in whom all the promises of God find their “Yes” and “Amen” (2 Cor. 1:20).